www.LRN.com Knowledge Service Provider™ 1-800-598-2809 /company/lrn NEW YORK 745 5 th Avenue, 8 th Fl New York, NY 10151 Direct: 646.862.2040 UNITED KINGDOM 29 Lincoln's Inn Fields, Holborn, London, WC2A 3EG Direct: +44 207 611 9900 INDIA Nirlon Knowledge Park Block B6, 3 rd Fl Goregaon East Mumbai, 400063 Direct: +91 22 6151 @lrn TIP! Use this simple metric as a benchmark for future campaigns. To demonstrate program effectiveness, aim to reduce this number by identifying what content users are struggling with and taking proactive action. TIP! Identify questions where users are making the wrong choice and provide clarification via course customizer to fill the content gap. This will help users answer questions correctly and reduce the overall attempts metric. IS CATALYST ANALYTICS AVAILABLE TO EVERYONE? Catalyst Analytics is available to all LRN Partners that are on the Catalyst platform and leveraging LRN HTML5 courses from LRN Console/LCEC or AICC. 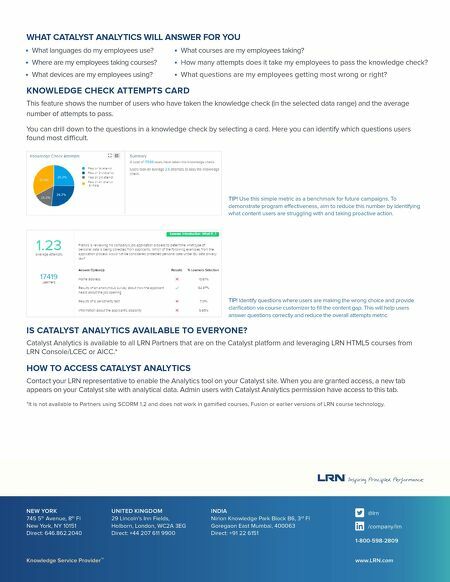 * HOW TO ACCESS CATALYST ANALYTICS Contact your LRN representative to enable the Analytics tool on your Catalyst site. When you are granted access, a new tab appears on your Catalyst site with analytical data. Admin users with Catalyst Analytics permission have access to this tab. *It is not available to Partners using SCORM 1.2 and does not work in gamified courses, Fusion or earlier versions of LRN course technology. KNOWLEDGE CHECK ATTEMPTS CARD This feature shows the number of users who have taken the knowledge check (in the selected data range) and the average number of attempts to pass. You can drill down to the questions in a knowledge check by selecting a card. Here you can identify which questions users found most difficult. WHAT CATALYST ANALYTICS WILL ANSWER FOR YOU • What languages do my employees use? • Where are my employees taking courses? • What devices are my employees using? • What courses are my employees taking? • How many attempts does it take my employees to pass the knowledge check? • What questions are my employees getting most wrong or right?